Five Latter-day Saints were sent to Paris to refine their skills so they could paint temple murals. When Latter-day Saints made the Rocky Mountains their refuge in the West, they saw painting and sculpture as integral to their efforts to bring culture, grace, and beauty to their growing settlement. Unfortunately, LDS artists who wished to contribute to that beautification were isolated from the cultural centers where their skills and gifts could be refined. Consequently, in 1890, two LDS artists, John Hafen and Lorus Pratt (son of Orson Pratt), hit upon a solution. They went to the Church and requested financial assistance so that they and several other promising artists could receive the training they needed. In exchange, they would paint murals in the temples and render other art services. President George Q. Cannon, of the First Presidency, informed Brothers Hafen and Pratt in June of 1890 that their proposal had been accepted. Three artists﻿—John Hafen, Lorus Pratt, and John B. Fairbanks (father of sculptor Avard Fairbanks)﻿—were soon set apart as art missionaries and sent to Paris; Edwin Evans joined them three months later, and Herman Hugo Haag arrived the next year. The conditions these missionaries faced in Paris were difficult: Food and lodgings were obtained at the least expense possible, and the Julian Academy where they studied was crowded, with strict and demanding teachers. The students were in constant competition with others from Europe and America. Still, the artists from Utah distinguished themselves, winning a number of competitions. The work of these and other Utah artists, prior to their study in Paris, is considered unsophisticated, with inaccuracies in perspective and proportions and showing limited technique. Following their training by the academic masters in Paris in the 1890s, these Utah artists painted with greater proficiency. They not only acquired new techniques, such as a loosening of brush strokes and freer use of color, but they began to see their subjects differently. Painting outdoors, beyond the limits of their studios, for example, enabled them to more clearly observe the effects of light on their subjects. Many of them brought home to Utah the influence of French Impressionism, with its emphasis on landscapes and harvest scenes. As the name implies, Impressionism seeks to create an impression of a scene or figure rather than an ordered composition strictly rendered. 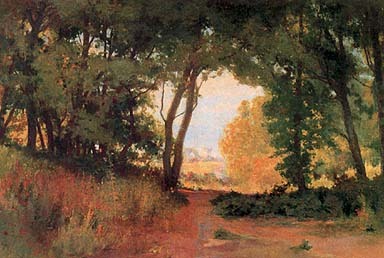 Daubs of strong color in short, broken brushstrokes are often used to capture the atmosphere of a scene or the immediate feeling of the moment. An impressionist landscape often has dramatic contrasts of brilliant, often shimmering, sunlight and shadows in subdued but rich colors. Because of the economic difficulty in which he had left his wife and children, John Hafen was able to spend only a year abroad. As the first art missionary to return to Salt Lake City, he was the first to begin the Salt Lake Temple murals. He worked alongside Danquart Weggeland, a Danish convert who had taught these artists before their missions and had encouraged them to go. A year later, Brothers Hafen and Weggeland were joined by Brothers Evans, Pratt, Haag, and Fairbanks. By the time of the Salt Lake Temple’s dedication on 6 April 1892, they had completed the murals in the world and the garden rooms. 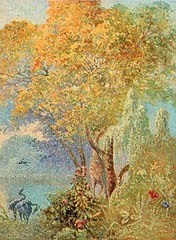 Garden of Eden (circa 1892), unsigned studies for the Salt Lake Temple murals, possibly collaborative efforts. The temple murals they painted, as well as the paintings in the Church administration building, increased interest in the arts. But just as important is the influence these art missionaries had on succeeding generations of artists. Having honored their commitment to paint temple murals, each continued to devote his talents to the Lord throughout life, leaving a legacy that others would build upon. 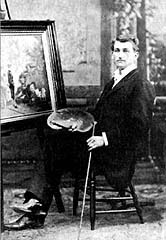 Edwin Evans, following his work in the Salt Lake Temple, painted in nine rooms of the temple in Cardston, Alberta, and taught art at the University of Utah. In 1920, he returned to Paris to study for two years, then taught art and painted in Utah until he died on 4 March 1946. 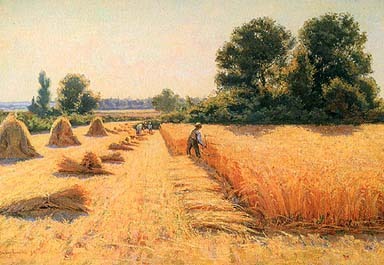 The Harvest (1895), by Edwin Evans. John B. Fairbanks became the first supervisor of arts in the public schools in Ogden. Brother Fairbanks may be best remembered for his posterity﻿—a family containing several noted artists. John Fairbanks lived his last fifteen years in New York City, serving as a patriarch in the Church. He died there in 1940 at the age of eighty-four. 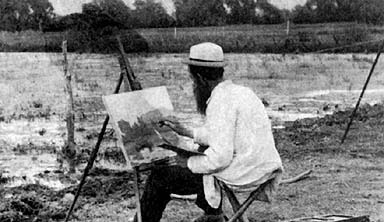 Fairbanks sketching in Utah Valley about 1897. Fairbanks was one of the primary painters of the Salt Lake Temple murals. Following his Paris experience, Herman Haag taught at the University of Utah, showing exceptional talent. Sadly, he was plagued with ill health and died in 1895 just before his twenty-fourth birthday. 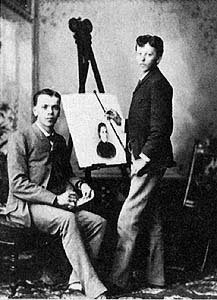 Herman Haag (standing) with his older brother Richard, in 1887. Haag, at age nineteen, joined the art missionaries in Paris in 1891. 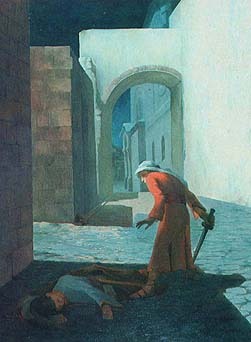 Death of Laban (1894), by Herman Haag. Lorus Pratt continued to paint and farm and care for his family as a faithful father. His paintings portrayed the agrarian development of both Salt Lake and Cache valleys. Self-Portrait, by Lorus Pratt, painted about 1886. Pratt, along with Hafen, was instrumental in appealing to the First Presidency to send Utah artists to study in Paris. He was the first of the art missionaries to have a drawing chosen for the concour, a weekly contest for the best drawing at Julian Academy. 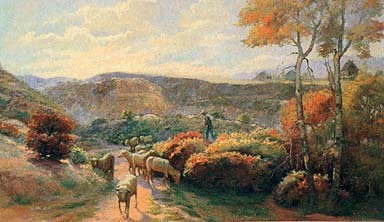 Pastoral Scene, South Salt Lake City (1890s), by Lorus Pratt. John Hafen is the best known of the art missionaries today, though at the time he struggled to support his wife and ten children. Today, of all the art produced by these painters, John Hafen’s works remain in greatest demand. Several painting trips to the east and west coasts of the United States gave him the opportunity to paint a variety of scenes in a variety of settings. In 1910, Brother Hafen died of pneumonia at age fifty-six. John Hafen, about 1878. In Paris, Hafen spent time out of the classroom refining his painting skills because he wanted to keep his “out of door acquaintance with nature on a par” with the more formal compositions he drew at the academy. “Both are studies and likewise cultivate drawing abilities,” he wrote. Scene in Draper, Utah (1900), by John Hafen. In recent years, the proficiency attained by these and later LDS artists has been increasingly recognized. A recent revival of Impressionist art and a popular exhibit at the Museum of Church History and Art have brought renewed attention and considerable appreciation for the work of these artists who harvested the light during an art mission to Paris nearly a hundred years ago. Bluffdale (1902), by John Hafen. Jordan River Landscape (1901), by Lorus Pratt. 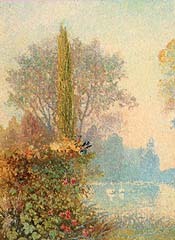 Backyard in France (circa 1892), by John B. Fairbanks. Aspen Grove (1916), by John B. Fairbanks. The Calf (1899), by Edwin Evans.